I love spring cleaning. I love clearing out stuff, making a giveaway pile, a recycling pile, and a garbage pile, and putting everything where it should be. My boyfriend and I spent today emptying out our storage room. Our apartment-condo has a storage room actually in our house, and a separate storage unit too. Today we tackled the in-house one. I’m always amazed at the junk I think I need to keep. If I didn’t keep all that crap, I wouldn’t need to have clear-outs! I’ve also been attacking the stash, and my UFOs. I sold 3 skeins of Mountain Colors Bearfoot to a lady in town, and 4 knitting books to her too. 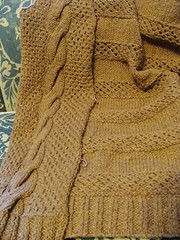 I still have a few skeins left up on Ravelry. I’m also doing a trade with another Raveler, we’re trading some yarn. It works out so well, because I get yarn I want, so does she, and we both get rid of stuff we’re tired of! 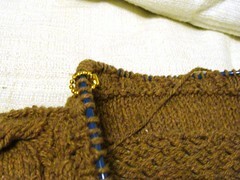 The thing I’m most proud of though, is dusting off my $1.50 cardigan again, and actually commiting to finish it. I started this back when the magazine came out, so Spring 2007. I got most bits done, then stopped. I dusted it off September 2008, and had finished all the bits by November 2008. Then it sat in the box again, until yesterday! I got out the bits, seamed the fronts to the back, and even picked up the button band! It was also a great chance to test other functions of my Stitch Marker Revolution markers. I had a hunch they’d be more useful than regular stitch markers, and I was right. They open and close, so it was easy to slip them on the needle at the right points once I’d figured out where the buttons needed to go (the teal ones in the pic above). 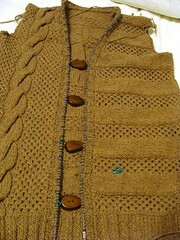 I also changed the button holes from what the pattern says. 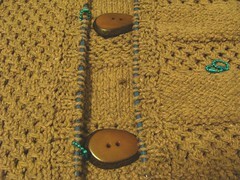 Pattern says to do a yarn over, but because I have big buttons, I did a 4-stitch one-row buttonhole instead. They were also very useful for dividing up the fronts into quarters so I could pick up stitches evenly for the button band (Lavender in that pic). I usually use safety pins for that, but these are more fun. I found it easiest to stick the connector part through a stitch or between stitches. I even used them instead of safety pins to baste the pieces together. No pictures of that, I’ll take some when I do the sleeves. But you just poke the connector through the edge of one piece, then the other, click it closed, and there you are! These are the small size, and they worked very well. I think the big ones would be too loose to baste edges together. I saw one of your posts over on Ravelry at Live Simply and thought I would say hello. I’ve decided to give the 1000 Challenge a try too. And I love your cardi! Great job!